Ekenas Glasbruk, a Swedish glassworks, was founded in 1917 by R. Stahl and Hjalmar Stahl, who formally worked at Orrefors. 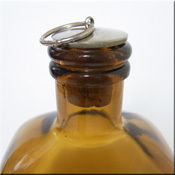 In 1922, Sven Westberg bought the company, and was manager until he died in 1962. It was then ran by Claes Tell and his son until the company closed in 1976. Designers at the factory included John Orwar Lake and Michael Bang. Ekenas Glasbruk Swedish blue + green glass vase, designed by John-Orwar Lake, signed to base + labelled. Ekenas Glasbruk Swedish blue + green glass vase, designed by John-Orwar Lake, signed to base. Ekenas Glasbruk Swedish blue + green glass vase / bowl, designed by John-Orwar Lake, signed to base. Ekenas Glasbruk Swedish blue + green glass dish / bowl, designed by John-Orwar Lake, signed to base. Ekenas Glasbruk Swedish blue + green glass lidded trinket dish, designed by John-Orwar Lake, unsigned. Ekenas Glasbruk Swedish pale blue + green glass vase, designed by John-Orwar Lake, signed to base. Ekenas Glasbruk Swedish pale blue + green glass vase, designed by John-Orwar Lake, signed to base + labelled. Pair of Ekenas Glasbruk Swedish pale blue + green glass candlesticks, designed by John-Orwar Lake, signed to base. Ekenas Glasbruk Swedish pale blue, green + amber glass bowl, designed by John-Orwar Lake, signed to base. Ekenas Glasbruk Swedish pink glass candlestick, designed by John-Orwar Lake, signed to base. Ekenas Glasbruk Swedish purple cased glass vase with label. Ekenas Glasbruk Swedish blue glass vase with label. Ekenas Glasbruk Swedish red glass vase with label. 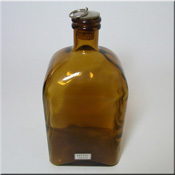 Ekenas Glasbruk Swedish amber glass cocktail carafe with swizzle stick, both labelled. 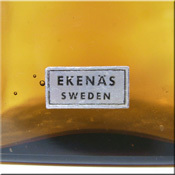 Ekenas Glasbruk Swedish amber glass bud vase with encased bubbles in the base, labelled. Ekenas Glasbruk Swedish blue glass bud vase with encased bubbles in the base, labelled. Pair of Ekenas Glasbruk Swedish labelled clear glass candlestick holders. Ekenas Glasbruk Swedish labelled blue glass candlestick holder. Ekenas Glasbruk Swedish labelled blue glass vase with inner white casing. Ekenas Glasbruk Swedish purple glass vase with inner white casing. 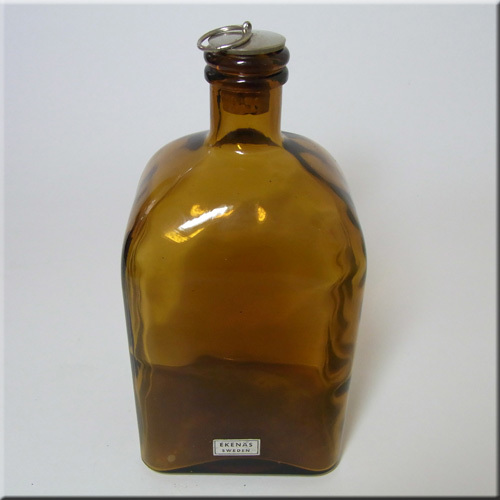 Ekenas Glasbruk Swedish amber glass vase with inner white casing. Ekenas Glasbruk Swedish labelled lilac glass vase with inner white casing. Ekenas Glasbruk Swedish labelled blue glass vase with inner white casing. Ekenas Glasbruk Swedish purple glass vase with inner white casing. Ekenas Glasbruk Swedish blue glass vase with inner white casing. Ekenas Glasbruk Swedish blue glass vase with inner white casing. Ekenas Glasbruk Swedish labelled blue glass vase/jug with inner white casing. 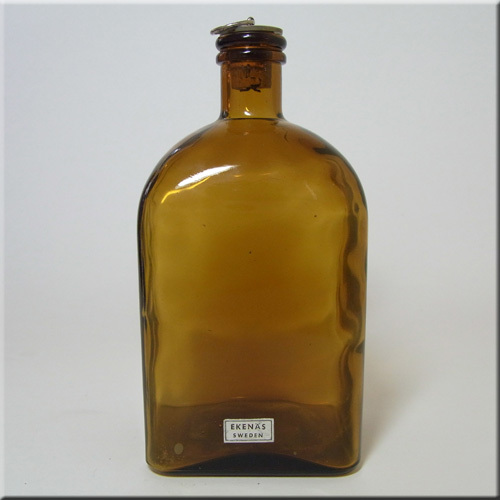 Ekenas Glasbruk Swedish labelled amber glass bottle/decanter. 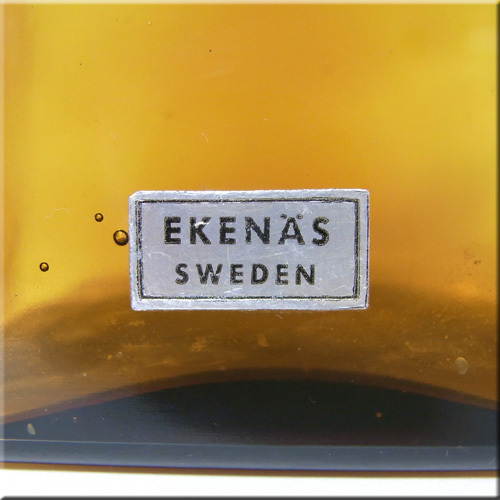 Ekenas Glasbruk Swedish smokey amber glass bear with label.